The internship is a vital part of the lives of the high school and college students. 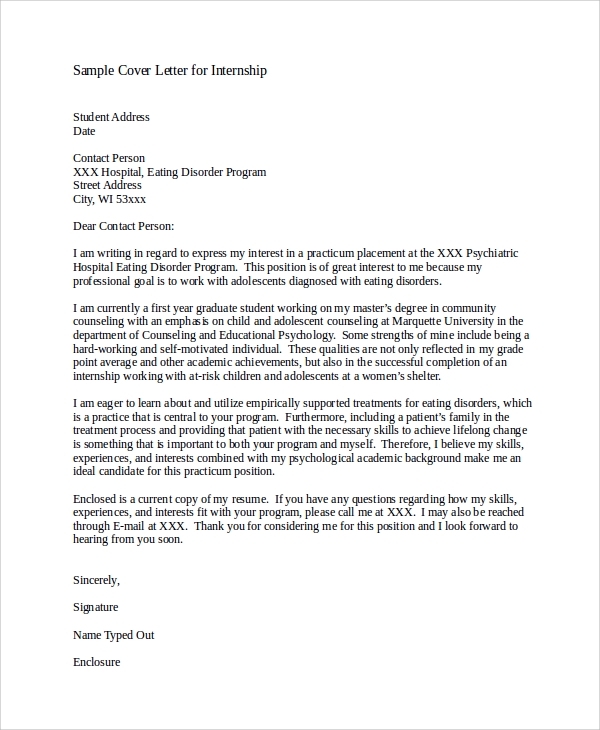 To apply for an internship, students have to send resume with cover letter. 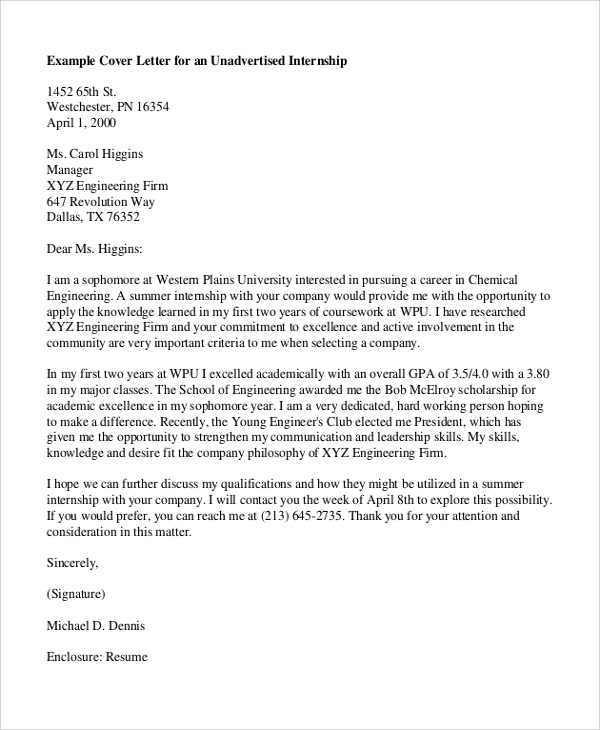 It is these cover letters that determine whether a student will get a chance to do the internship program or not. 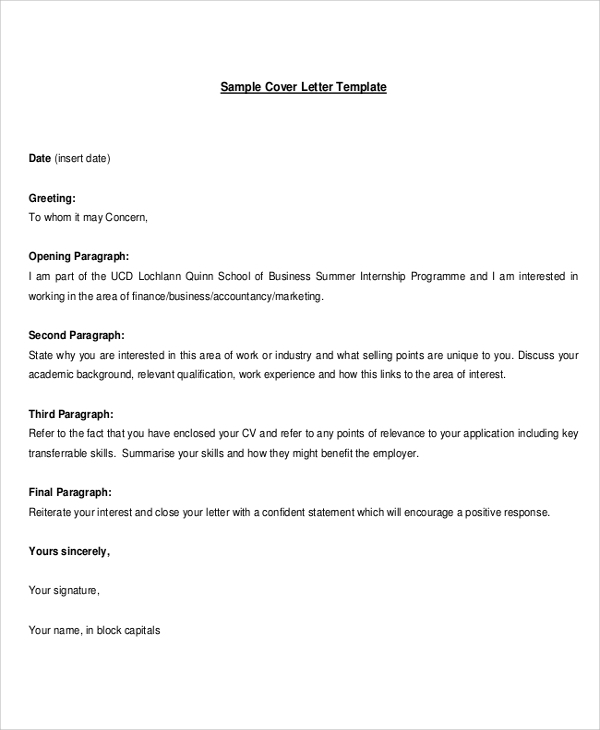 The following internship Cover Letter Samples cater to different types of an internship with ready-made templates and formats along with guidelines and sample statements to write stunning cover letters for resumes. This is a perfect manual which illustrates with an example how to write a cover letter for a business internship. It provides multiple examples of different kinds of cover letters of various types of business internships. 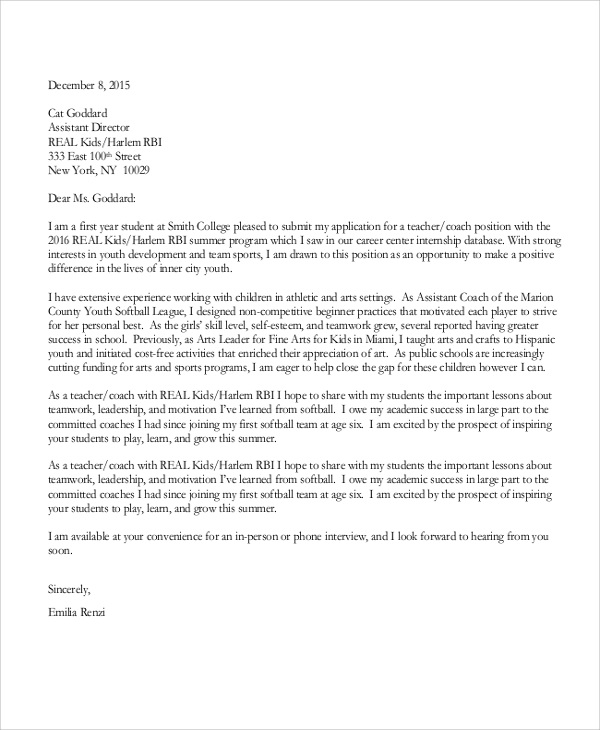 It is a complete cover letter that is highly useful in applying for sports internship. It highlights the strengths and passion of the candidates that make him or her perfect and deserving one for the internship program so that the candidate can excel and scale new heights. 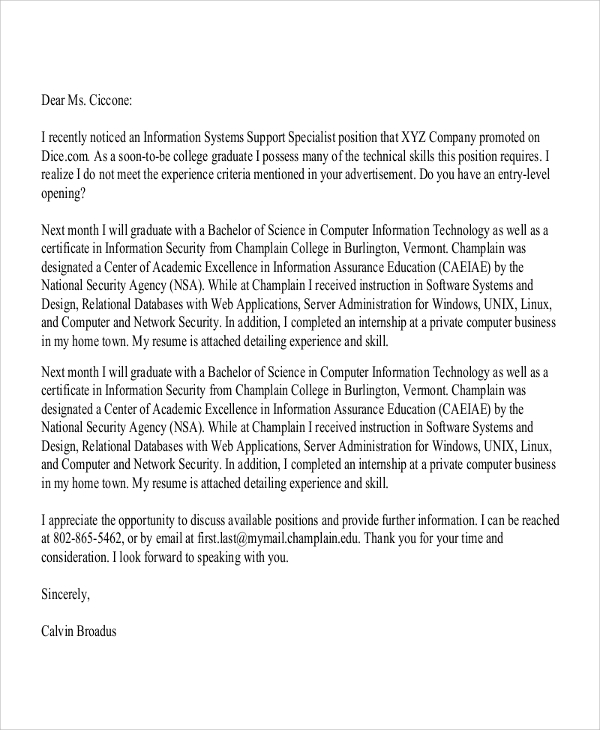 You may also see Cover Letter Formats. 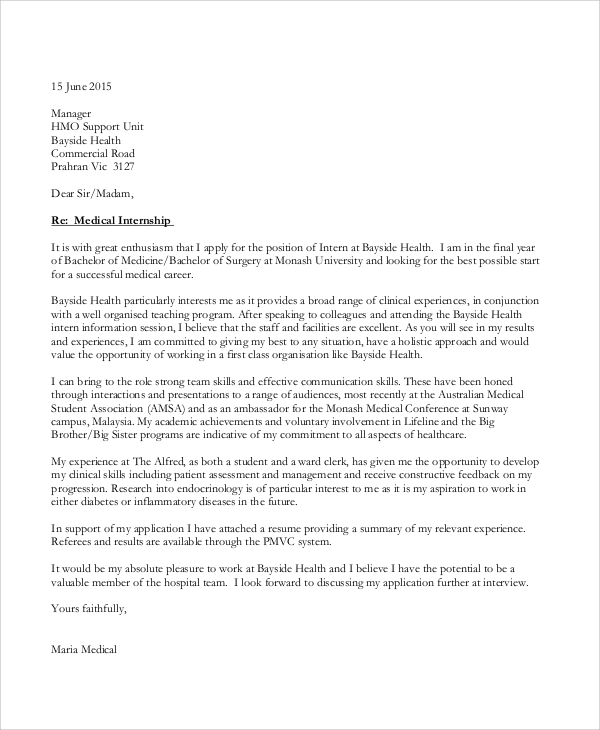 This is a well-designed cover letter sample for applying for medical internship. It highlights the strong points, personal traits and academic background that make the candidate a suitable for the post. It also points out the candidate’s passion and future endeavors. 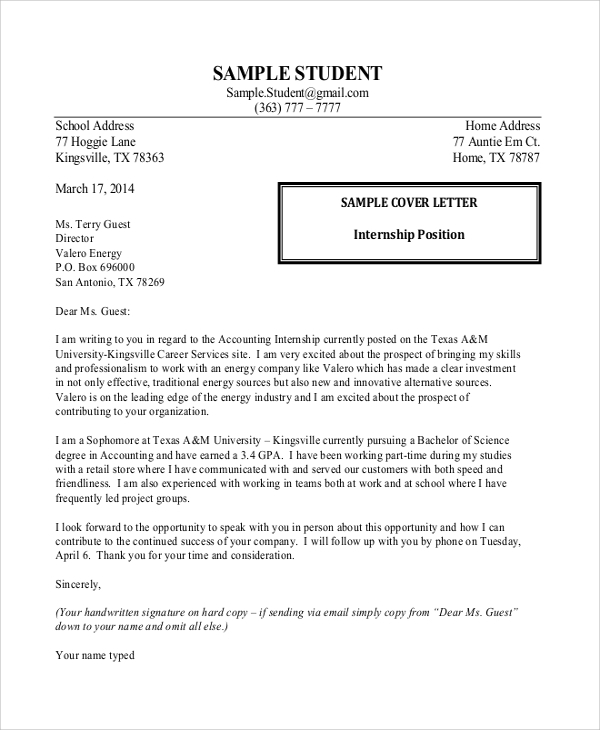 Cover letters are highly critical to get a chance to do the desired internship program. The basic cover letter templates and samples provided above are enough to write a stunning cover letter for different categories of internship program instantly. They have sample statements, the illustration of the points to cover in separate paragraphs, action words and phrases and template to follow. There are separate templates and formats for Email Cover Letters as some of the internships like to make the candidates apply through email. All one needs to do is to follow the guidelines and prepare their cover letter around the samples. This is a perfect cover letter of applying in an internship program for counseling. It highlights the passion of the candidate, points out the strengths that make the candidate deserving and gives academic background and personal traits with action words. 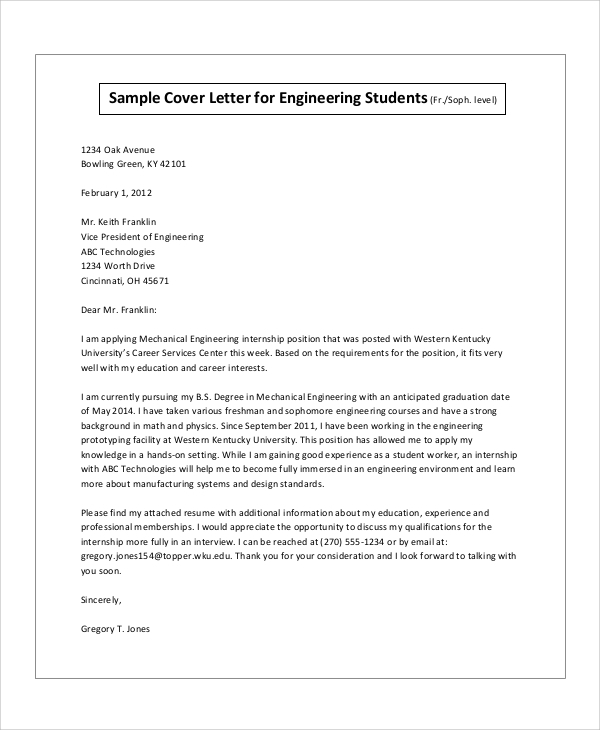 This cover letter for research internship explains how to write a cover letter to edge past the competitors applying in the same program and it includes all the powerful words and phrases that will come handy in writing a stunning cover letter for a research internship. You may also see the Basic Cover Letter. That targeted audiences for the Internship Cover Letter Samples are the students from middle school, high school, colleges, and universities. Students use their vacation to do an internship to get a taste of practice and professional life and make their experience and resume worthy enough for future. Even the parents can use them to write on the behalf for their children so that their children can edge past other competitors theoretically. 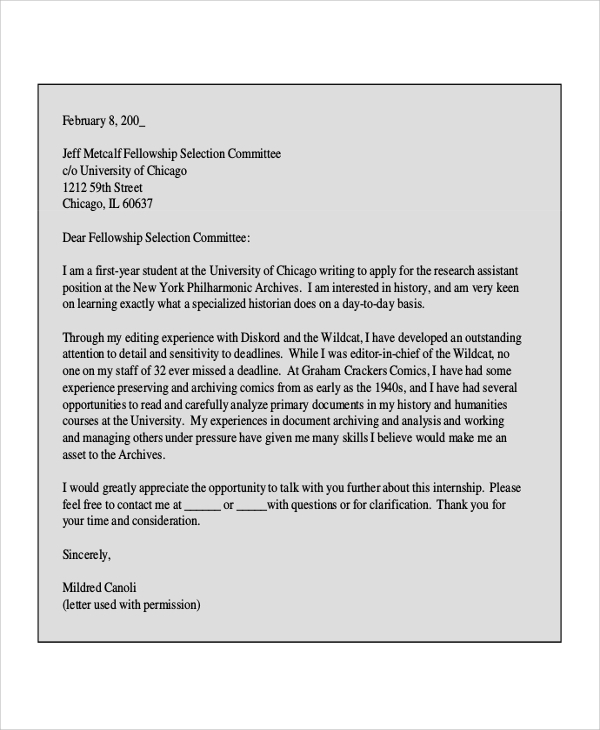 The above-listed Sample Cover Letters cater to internship opportunities like in the field of research, medical, business, counseling as well as sports. Different types of jobs require different types of cover letters and all of which are clearly explained, illustrated and described so that everyone can write their best cover letter to apply for the internship program they desire.